9/29/09 "Cartoony Tim confesses his love"
It's a love filled day. 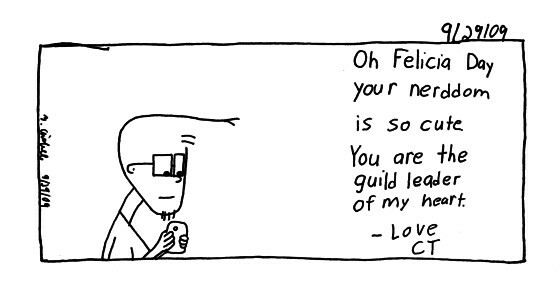 I finished this comic and now Cartoony confesses his (by proxy my) love for Felicia Day. The spunky and socially awkward girl from The Guild. I guess it helped that I watched the new episode of the Guild and Dr. Horrible's Sing A long blog today. "Do you wanna date my avatar? She's a star. And she's hotter than reality by far. Wanna date my avatar?"